Munich - 'Oans, zwoa, drei: Treble!' An adaptation of the famous mantra from Munich’s Oktoberfest sums up a season of superlatives which is well worth raising a glass to, and a large one at that. Never before has a German team won three major titles in a single campaign. The legendary Borussia Mönchengladbach and FC Bayern Munich sides of the 1970s didn't manage it, and neither did the early eighties' Hamburger SV of Manfred Kaltz, Horst Hrubesch, Kevin Keegan et al. In 2012/13, however, FC Bayern pulled of the , to write a fresh and unique chapter in the club's already illustrious history. As captain Philipp Lahm raised the shiny golden into the Berlin night sky at 22:11 on 1 June, the glory was complete. After the quickest Bundesliga title of all time and the coveted UEFA Champions League triumph, the domestic cup now rounded out the immaculate treble. 12 months on from the “Drama Dahoam”, the men from Munich had rewritten the record books. “Gigantic - an absolute highlight. 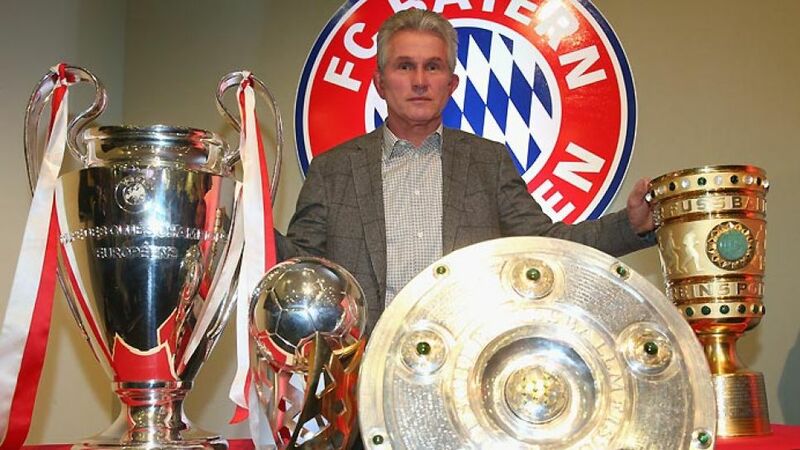 The treble's unique,” said a euphoric Jupp Heynckes. And in achieving it, the outgoing head coach has assumed a unique niche of his own in the annals of the game. Two Champions League final defeats in three years and successive Bundesliga bestings at the hands of Borussia Dortmund had left a distinctly sour taste in Bayern mouths. The stated season priority for 2012/13 was to win back ‘their’ domestic title, a mission duly accomplished in high style: 91 points, 25 clear of Dortmund in second place, and a single defeat over the course of an unprecedented campaign in Germany's top flight. The Reds from the Bavarian capital brushed all-comers aside in the league, sweeping away the records in their path: most points, best away record, most wins to name but three of 18 new best-marks all-told. Bayern’s self-belief and resolve never wavered from start to finish. Even after clinching the title on Matchday 28, there was no coasting. “The opportunity to set even more records is what motivated us,” Lahm acknowledged. One of the keys to Bayern rediscovering their traditionally merciless winning attitude was undoubtedly the appointment of Matthias Sammer as director of sport in the summer. His grumbling, in spite of the positive results, and generally pernickety demeanour helped maintain a constant edge and honorary president Franz Beckenbauer made a particular point of lauding the 45-year-old's contribution. Out on the pitch, new signings Dante, Javier Martinez and Mario Mandzukic were really making their mark as the effectively reconstituted backbone of the team. Brazilian centre back Dante slotted in seamlessly following his arrival from Mönchengladbach, while Mandzukic brought more variety to Bayern's forward play, finishing the season as top scorer on 15 goals for good measure. Martinez meanwhile fully justified his record-breaking price tag, the 24-year-old arrival from Athletic Bilbao settling in to become the perfect foil for Bastian Schweinsteiger in the deep midfield department linking defence and attack. 28-year-old midfield general return to his world-class best with a vengeance. So wherefore now for Europe's undisputed team of the year? Heynckes has departed on an unparalleled high, to be succeeded by the most successful club coach of recent years, Pep Guardiola. The 42-year-old Catalan tactician officially takes office on 24 June, tasked with nothing less than cementing Bayern's place among the world elite over the longer term. That, for Guardiola, is familiar territory already of course.